NHBR's editors recently met with representatives of the New Hampshire banking and finance industry at the Greater Manchester Chamber of Commerce to get an overview of the sector and find out what they believe the future holds, both in the short and long term. What's your take on the state of the lending business in New England in general and New Hampshire in particular? Jeanne Hulit: What we see is the SBA guarantee portion of the lending market, and what we're seeing in New England is that there has been significant growth year after year after year. In New England, there was a 30 percent increase in 2009 to 2010 in our fiscal year — an increase of small business loans guaranteed by the SBA. This fiscal year, there has been a 29 percent increase. So we're seeing some very good things, and when you compare that to 2008, obviously the 2009 fiscal year is dramatic. We're seeing lending rebounding, and we're also seeing more dependents from the banks on using SBA guaranteed programs. Is that specifically true for New Hampshire as well? Greta Johansson: Yes, that is true. In addition, one of the things we are seeing in New Hampshire, is the increased guarantee and the fee waivers of the Recovery Act and the Jobs Act brought lenders back or to the table for the first time — lenders who had not been participating with us and found it beneficial to form or reform that relationship. And those lenders are staying with us; they aren't dropping out because the enhancements are gone. They're staying with us and doing more and more with us. Donald St. Germain: I think the SBA remains a great go-to resource. Between the 7A and the 504 loan programs, someone can purchase a piece of real estate with 10 percent down, and the institution stays very well collateralized at 50 percent, first mortgage. So it absolutely works, and we've utilized it more. It's an express program that is very expedited on the paperwork that guarantees a 50 percent share. We have used all of that more than we have in previous years. Joe Carelli: We've had tremendous success on both fronts. We've seen a pretty significant uptick with the 504s, allowing people to both acquire and expand their businesses. And it's interesting, because one of the benefits of the 504 is it allows up to 90 percent financing. Typically what we are seeing is companies aren't using that because they don't have the cash. Most companies today have more equity than they did before, but they are looking to conserve their cash. The 504 has been a great program to allow financing and keep their liquidity — and keep their powder dry for more opportunities. Also, on the 7A front, we are at $6.9 million dollars credit year to date in SBA dollars — which is some of the largest volume we've seen in the last several years. What are these loans being used for? Dianne Mercier: This is New Hampshire, and we very much believe in company ownership than other markets. In Massachusetts, there is a greater desire to lease your space; in New Hampshire, there is a greater desire to own your space. I think that the preponderance of business that we do in New Hampshire is going to be real estate. Whether it's for your own operating company or for investment and development, it's very heavily weighted towards real estate. I think the SBA is especially effective in helping us manage real estate, particularly in a market where the property value and rates have been declining. The rates are great for people to lock in for a long time.John, you work somewhat differently. John Hamilton: We're an alternative source for financing. What you just heard is a great example of how we're getting, through partnering with the banks and SBA, capital to the businesses that need it. It's also true that having just come out of the recession, a lot of businesses aren't squeaky clean. Their P&Ls, which are used as an indicator, don't reflect the kind of changes that the businesses are undertaking to adapt to the changes in the market. Some of them have needs for capital that make sense, but not when you look backwards at the P&L and the collateral. That's what we focus on: How to get those businesses capital so they can grow. We work mainly with businesses with less than $15 million in revenue. We specifically don't target startups. We do have a program where we do loan funds to help startups — it's called "match savings," individual development accounts. It's for people who save money — we will match it three times for every dollar saved, up to $8,000. This is a way that a lot of self-employed folks can save up some equity to start a business. In general, our focus is on established businesses that have been in business for at least a year and have 12 months of operating revenue. There is where we feel the New Hampshire economy is going to gain the most — by finding a way for these businesses to get that risk-tolerant capital to release some growth. A lot of people have been talking about that these days — companies that can innovate and add value to their customers are what really will help the New Hampshire economy to thrive. The businesses may be risky because they have a sales concentration or they don't have significant collateral, or many other reasons. But what we do is take the time to get to know their growth proposition and unearth more about the business. We study the market and their team and see if there is a creative way to get to yes. St. Germain: There's also sub debt, as they call it — subordinated debt, which will allow them to take a position behind us to allow things to happen. The New Hampshire Business Finance Authority operates similar to the SBA, but by design there isn't a lot of overlap. Guaranteeing loans that banks and credit unions back by city economic development departments, and most cities have them. Block grant money, depending on the purpose, is sub debt. So if there is a desire and means to pay, there is absolutely ways to get things done. It doesn't have to be a bank or credit union exclusively funding it, and oftentimes it isn't. Carelli: It's interesting, because we think of each other, us bankers, as competition. And let's face it, a fair amount of competition is healthy — it ensures that we are providing the best products and services at the best price for our client. But many times we think of each other as complementary, and so it's great to have an opportunity to where maybe we say to the client, "we think that your cash management purposes are really well suited for me and we want to partner with John Hamilton because he has a perfectly suited loan product for that small business." I think sometimes if we think of ourselves more as complementary than as competition, we can have a more beneficial impact on the business community. Hamilton: I absolutely concur with that notion. It's often a portfolio company, and they can't get it though the credit committee because of whatever barrier. We're able to help them grow the portfolio company by extending additional capital. Or, another situation, we have been brought in by others where there's an M&A going on. And there's about $1.2 million that is there but doesn't have the collateral. And we get brought in, so that becomes a new customer for the bank. We're able to do the piece that wasn't bankable beyond collateral and we structure it much differently than a bank would. But together we partner and get the deal done. And that becomes a new member of their portfolio for the bank. There's this old-fashioned view of banks, not necessarily true, but it's the general belief that you had a bank in town and the businessperson would talk to the banker and after a conversation and a handshake, the businessperson would get the loan. Mercier: Let's talk about that simpler, gentler time when you could come in and talk with me and sign a piece of paper, when you could get a loan and sometimes you would sign your loan documents after I gave you the check. That sounds very nice, but it turned out to be quite a catastrophe for us, ultimately. Very innocent people suffered because of that. We always have concerns about the level of regulation that we have and how we are governed, but we need to be prudent in the way that we do things. So the process has changed significantly, even from the time that I have been in banking, such that no one person really makes their own loan anymore. There isn't anyone that has the authority to sign a piece of paper and grant a loan. We are at a minimum two signatures, and more likely in a committee environment, whether it's a local committee or a more regional committee. It does tend to extend the process for the borrower, but if you have five people in a room, they are going to ask five different questions about the same loan, which takes more time and is more aggravating for borrowers. We lost a lot of interest when things were easy to do and the numbers just spoke for themselves, and I don't think that was for the betterment of our businesses. It does feel very much like a pendulum is coming back. I'm sure it will right itself a little more over time as things get easier, but I think it's a good lesson for all of us — we should be supremely interested in our customers and how they are growing and is that sustainable growth. Is it the right kind of leverage, are they introducing the right kinds of products, are they doing sustainable things? St. Germain: You're right, there's a line you can't cross. The regulators are a check on the system, and an appropriate check on the system. One loan we can't make and is prohibited is to someone who can't afford to pay. It's a disservice to everyone. One lesson we've learned is that credit scores don't pay bills, cash flow does. That's kind of where we're swinging back to. The underwriting process is a little more comprehensive than a few years ago. Hulit: One of the frustrating things we see on the SBA side is a borrower who goes into a bank and even if it's the right bank, they are going to the wrong person. They are going to the wrong branch when they really need a very specialized product. And that branch makes it sound like we can't help them. Some are better than others in referring them on.When you go into a bank that doesn't have an appetite for that particular kind of business and they are declined, then they think that banks aren't lending. But there may be another bank that has an appetite for that loan. So that's where the SBA can actually be helpful. If a small business is putting their business plan together, they can come and talk to us about what they are needing for financing, and we can help guide them towards the lenders that know SBA programs. We can connect with other business resources. It's a frustrating thing when we hear of businesses who make one step and then throw up their hands and say banks aren't lending. That's usually not really the answer — that's just one person or one institution's answer. There could be other ways to get that deal financed. Hamilton: Going back to that simpler time you mentioned, I think the current version of that is that when we partner with the banks they very often receive a customer and when they say no, they don't just say no, they say but I know another possibility. And that's the relationship-building that was done in the '50s and now the 2011s — that connecting with other sources of capital to fill out. It's important that we know the importance in each of those choices, then apply the right tool to the right opportunity. What about educating businesses and individuals on how financing works? Hamilton: Accountants are a great resource in how to answer that question. The reality is businesspeople are busy, problem-solving day-to-day business challenges. To ask them to take time out of their day to come and listen to a seminar on financing is difficult. But accountants are looking for a way to add value for their clients. We find that a lot of referrals come from accountants who see it as their job to fully inform their clients. They're often the first ones to review the P&L and see the need for capital and say, "that's not bankable" or "this is something that is more equity appropriate." They can help bridge the knowledge gap and understand fully the variety of tools that are out there to get financing to establish businesses. Johansson: There are attorneys around too who can help, maybe not to the same extent but on a similar note to bring value to their customer, to make it worth having a small business attorney on retainer. There have been times when I will be at a convention, and it's not the small-business owners I'm talking to, but the small-business attorneys who were there educating themselves for the sake of their clients. St. Germain: I don't think you'll find a commercial lender who isn't willing to sit down and go over the fundamentals. That's our reason for being, is making loans and putting that money on the street. Mercier: I try to think of things in terms of our customers, and financing is one-one hundredth of what these people will think about every day. We need to be much more valuable to our customers than explaining to them how to get an SBA loan or a line of credit vs. a term loan. We have such expertise, given the variety of industries that we lend to, the variety of relationships that we have, that sometimes the best answer to financing is "no." In which case, we need to be willing to talk about why that answer is no, and why it's the best answer for them — the things that they need to do to get to yes, or that maybe it is never a good idea to get to yes. 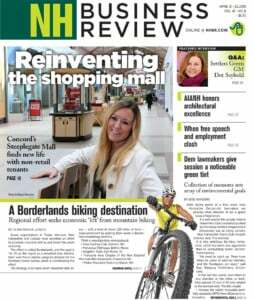 NHBR has had articles over the last few years about how businesses can't get financing and everything is dried up. Then there are articles a short time later saying banks have all sorts of money to lend. Mercier: Rates are especially low, so they are super-attractive. And property is very interesting to buy right now because it is low. People are thinking that is the right time to buy, when property rates are low and interest rates are low. But the conundrum is that it is so much harder to qualify to get that loan today than it was three or four years ago, for the reasons that we've talked about: the underwriting criteria is harder and, frankly, people still have a lot of debt and have quite a bit of leverage. The balance sheets that were really strong two or three years ago are very weak and fragile right now. So it's a conundrum for people right now. Hulit: I did bring a little bit of statistics. Small business credit standards have eased for the last four consecutive quarters, according to the Federal Reserve. And just last month Thomson Reuters reported small-business lending, not just SBA lending, increased 26 percent from May 2011 to May 2011. There is an easing occurring — it may not be as visible because people really do like to harp about the fact that it isn't the way it was three or four years ago, but it is better than it was 12 months ago. It's part perception and part reality. Balance sheets aren't what they used to be, but banks are lending. Carelli: Our commercial loan book is up 15 percent this year. There are really two reasons that drive loan demand today. There's what I call economic prosperity — companies that are acquiring new buildings and are needing to increase their capital lines of credit because their revenues are increasing. They are investing in inventory, the accounts receivable. And there's refinancing. I think you can break most of the bank market into economic prosperity and refinancing. We are seeing some economic prosperity-driven loan demand today. We talked about companies making acquisitions on the 504 because of the reduction in value. It's a good time to buy. But a lot of the transactions banks are seeing today are refinancing, and right-sizing balance sheets because there is no better time than now to borrow. Interest rates are at historic lows and look to be here for a while. Banks are in a great position to lend. They are liquid — bank profitability is coming back, and the loan portfolios at the banks are back. But still a lot of the demand that we are seeing today is refinancing, perhaps some of that higher-interest debt that have been on company's balance sheets. Restructuring legacy debt with some enhancements to allow for some breathing room for companies that have reduced revenues.So I think we should maybe think about that in really the context of what's driving demand. I think there is a little more weight on refinancing than economic prosperity. Hamilton: Our focus at Community Loan Fund is the growth-oriented needs businesses have, and we aren't really focused on refinancing, because we really are more focused on those companies that aren't getting what they need from their other sources of capital, but aren't looking to switch out of their current capital. It's only when the business can support a growth proposition that it makes sense to take on additional capital. St. Germain: I've heard that "there is no money to lend" line for years, and it really bothers me because it isn't the case. As Joe mentioned, there's very high liquidity in most institutions now. Savings rates have changed a lot — there's a lot of conservatism out there. People have told me they are holding back a little bit, but as consumers and businesses come back around with a little more confidence, and if we can get you qualified — which isn't miracle work, it happens every day. For instance, our volume was a little over $200 million each of the past three years. It wasn't 50 percent growth, but growth nonetheless. So we are all out there making the loans, people are qualifying every day. I would like to think the worst is behind us in terms of unemployment and the financials that we are seeing are improving.If someone is coming out of a rough couple of years they might not get everything they want but quite often they get some of it. There's no dark cloud there and I think there's better times ahead. Johansson: I would love to find more ways to get the word out to businesses that if you do hear the word no, then get real specific and ask the lender to be real specific with you about why. There may be a solution, and it may be you aren't ready for the financing or you may be talking to the wrong lender. But that's why we have our counseling resource center partners who can dig into that business' situation and help them identify ways they can strengthen the ways they may be doing things. They may also be able to strengthen those weaknesses and gain efficiency and eliminate the financing they were so sure they needed. Mercier: Small-business lending is up, and small-business lending was never really down in New Hampshire — especially not compared to the rest of the country. A lot of the voices we heard saying that lending dried up came from our residential developers. That is true that that lending and the ability to do residential development and finish projects did become exponentially harder for those developers. I am on Sen. Shaheen's small business advisory council, and those were the voices I heard, and those were the voices at the table. And that is still an industry that is struggling and those are still some voices that are loud.It's important to understand that it is not a lack of desire to lend to them, it's the lack of people's ability to buy their products from them. And New Hampshire is still having a very hard time with that. Hulit: We haven't lost any banks. New England has fared through this recession substantially better than other parts of the country. Our banks are strong, our unemployment rates are substantially lower. We tend to flog ourselves in this neck of the woods as not being as dynamic as other parts of the country, and in some ways that served us well. We didn't have the big peaks and we didn't have the big drops. We sort of just chugged along. Are there certain types of loans and certain kinds of businesses that are seeking and getting loans? Johansson: We have a complete and utter mix. St. Germain: We benefit from a pretty diverse economy here, so we're doing a little bit of everything. We are seeing some bright spots in manufacturing, actually. Multi-families are holding up — vacancy is pretty stable. From our standpoint it's a little of everything. Mercier: Manufacturing is good — I would say more equipment and more capital, because they are growing and their orders are coming back. And the people who are buying from them are buying in different ways than they did before. So they are having to finance that a little differently. Hulit: The manufacturing sector had really stopped investing significantly during the recession in terms of machinery and equipment, bringing on new people, bringing in more inventory. The economy is rebuilding, so we have seen manufacturing growth across the board in New England in terms of job growth as well as financing. Mercier: What's been nice for the manufactures here in New Hampshire, at least from what I have been seeing, is there's a lot of beauty to this trickle-down effect. A lot of the larger manufacturers that had integrated more the last decade, got out of a lot of that extended business and really focused on the core business, which caused them to have to sub out a lot of the work that they used to do themselves. And the benefit of that, on the 15-to-40-person manufacturing company, has been very profound. Over the last year, except for April for some reason this past year, they are all saying the same thing. This has just been a very good year. Very sustainable month after month of growth. Johansson: Manufacturing is fairly incredible. We think that we aren't a very strong manufacturing state, but we are. Not only that, the work that is done is highly skilled and very precise. Extremely cutting-edge technology. I'm amazed when I see some of the work that is coming out of these New Hampshire companies. It's phenomenal. Carelli: The strength of that, where we are seeing that is called the AMAHT — the Advanced Manufacturing and High Tech sector. And the benefit there is these are highly skilled, highly paid manufacturing jobs that are really helping to sustain the economy. And more importantly, those products and skill sets are not readily transferable overseas. So it's proprietary technology and proprietary products — some can be defense-related or medical-related — and because of the skill needed in the precision components, those skills will stay here. The products by and large are being sold overseas, but the jobs are staying here. We're seeing tremendous growth in those industries. Hamilton: The term might be value-added manufacturing, where there's high gross profit margins. That at least tells you that the company is really selling not based on price, but it's because they can solve your problems.To underscore, the New Hampshire economy benefits significantly from these CEOs of manufacturing companies in New Hampshire that have taken the risks, not just sat around crossing their fingers and just waited for the recession to be over — but those that have taken that time to readapt their business model and find ways to add value to their customer. Carelli: A lot of times in banking we say we don't lend to businesses, we lend to people. And it's all about getting to understand management. What are their strengths? How do they play, how do they run their company relative to the industry? How did they react in this last downturn? What's their probability to change their business in this new economy? Hamilton: Especially having come off the Great Recession, one of the first questions we talk to prospects about is it's OK to have had a loss or to have a hiccup. Our question is, what lesson did you learn from that? What changes did you make for your business? And on the basis of that answer we can often develop a strategy of how to get them towards a yes. Johansson: There's a difference between bad events and bad habits. You're going to be hard-pressed to find anyone who can lend to someone who repeatedly has bad habits. Bad events happen. That's where even if it falls outside of not immediately bankable, the bank still recognizes that this was just a bad event and put that extra work into finding alternative sources for these folks.So that's where we just really rely on our alternative lenders, and again it comes down to who is the person, what's the story here. Not, what's the credit score? Not to say we don't pull the credit score, but what's the story behind this so we can distinguish between stuff happens and the patterns or behavior vs. the just stuff happens.Which brings us to your feelings about where the New Hampshire economy is headed. St. Germain: We're pretty bullish about the whole thing. It's a great place to live. It's consistently ranked that way. I've mentioned before we're pretty diverse as a business climate, we don't rely on many large employers. Our employment rate is nearly half the national average. There are 49 states that would swap with us I'm pretty sure. So things are actually going fairly well.There are absolutely some folks that have had some problems, and the last thing I want to do is not recognize that, but overall and relatively we are doing quite well. Hamilton: I think the challenge is the people with low income who were hit the hardest by the recession. Businesses too that are larger have the ability to withstand the cycles easier, whereas the smaller businesses with less revenue certainly have had a hard time withstanding that. I think it somewhat depends on your perspective of what role you play in the market as to feelings these days. Carelli: I think clearly we've come off the low points. We're seeing a lot of industries and sectors that are improving. But we aren't at that part where we feel confident that we don't have any bumps along the way. And so we are seeing that with companies that are being very cautious, with excess in capital. While I think companies are being very opportunistic today, they're thinking twice before making big purchases unless they can see a significant ability to get a return on their investment in the near future. And they aren't making big bets on the future. They are typically waiting until they see they can support the investment and then backfilling versus making investments for much longer periods of time further down in the future. Mercier: In the context of how low we got, it was very dangerous for a while. It's been a couple of years of a very slow, almost schizophrenic, recovery since then. I think that while people are feeling the danger is behind us, they're seeing there's still a lot of work ahead of us. I don't think anyone kids themselves that it's going to be easy. But we'll get through it together. We got through the '90s together, and that was a very difficult time.If I take anything out of this, I realized a couple of years ago how much people got back to basics. We got back to the fundamentals of all of our work. Our businesses owners did, we did, and we got very serious about the fundamentals of what we do. And we still are, we are still fundamentally working through this. But I think the danger is behind us for sure. Johansson: I feel the same way, but sometimes I do hear a little doom and gloom that it won't get better. But I think it has and will continue to get better, but because it's doing it in such small, incremental steps, you have to get pretty far into the recovery before people start realizing that it really is getting better. And I think that feeds some of the cautiousness and dampens some of the optimism. Carelli: I think a lot of the way people feel about the recovery has a lot to do with the global climate today, and one of the consequences is you're hearing a lot about the financial markets globally. Five years ago, when you heard that Ireland's debt just got jumped on status that might not have meant that much to people, but today it means a lot. It means a lot about how you feel on the global economic recovery. I think there is still this tangential concern about where we are and there's a significant chance of things going wrong along the way. Mercier: Part of the doom and gloom is part of the big picture. We all measure how confident the economy is by job growth, and job growth has been very slow. It's dipped down a little bit, but beneath that private sector has been gaining rather significantly. The net loss is public sector jobs — look at all of our state budgets and our municipal budgets, and that's driving down the overall job growth number, even though private sector jobs are increasing.Of the increased net new jobs, 73 percent in the last year were small businesses. America has always come out of the recession led by small businesses. So that trend is occurring, and that's why all the things we have been talking about today are so critical and important. But until we flush though some of these macro issues on the public sector side, we have a lot of job losses to absorb. Hamilton: I too have no ability to speculate, but I would predict that while the size of the capital gap will shrink, there will still be a capital gap. And that goes back to the earlier point that we all play different roles in the market. We have to stop expecting the banks to do everything, and it's right and important for them not to be seen like that. It's important that we continue to develop relationships and ways to continue to find new sources of capital to make sure the full suite of needs that entrepreneurs and businesses have are met. And wherever we are on the economic cycle that will be true.